In a way that only the medium of comics can, The Book of Hope slows the reader down to the rhythms of the silent life of a retired couple living in a rural countryside. Behind the static, routine moments of everyday life something bigger takes shape. A flash of encroaching death starts to consume the husband, leading to visions and questions. 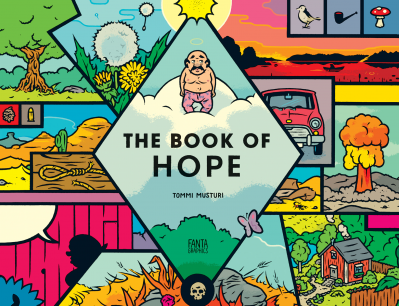 This graphic novel from cartoonist Tommi Musturi is a thoughtful exploration of the human condition, and the series of mostly quotidian moments that make up most of our lives. The strong presence of silence and nature reflect the arctic exotica of Musturi’s native Finland, but with a relatability, eloquence, and economy that will remind American readers of Chris Ware’s Jimmy Corrigan. The Book of Hope is a humane book filled with timeless humor and life itself.